October 19, 2007 John F. Kennedy Space Center Americas gateway to the universe Spaceport News http://www.nasa.gov/centers/kennedy/news/snews/spnews_toc.html Vol. 47, No. 22 STS-120 launch brings Harmony to station T HE STS-120 mission is a critical one in the assembly of the Inter national Space Station. Space shuttle Discovery will deliver the Italian-built U.S. Node 2, named Harmony, thus opening the door for NASA's partners to participate in the future of the space station. The addition of Harmony to the space station will allow the instal lation of the European Columbus Laboratory and the Kibo Japanese Experiment Module, providing a passageway between them and the U.S. Destiny Laboratory. The Co lumbus Lab and the Kibo module on missions in December and February. today, theres nowhere to put all the international partner modules until we deliver and activate Har mony. Thats the piece that makes the rest possible," said lead station about Harmony. The installation of the Har mony module will increase the living and working space inside the station to approximately 18,000 cubic feet. The additional life support equipment will allow the expansion of the crew to more than three and will boost the space station's capability. The mission crew will have to install Harmony in a temporary spot on the connecting node Unity until the mission is over because the shuttle will be docked to the existing adapter port where the node is meant to attach. After the shuttle leaves, the station crew will then move Harmony to its permanent position. The node will also provide connecting ports for multi-purpose logistics modules, the Japanese H II Transfer Vehicle and the pres surized mating adapter 2 to which space shuttles dock. The space sta tion robotic arm, Canadarm2, can operate from a powered grapple The Node 2 module was developed for NASA under a European Space Agency contract with European industry, with Al catel-Alenia Space as the prime contractor. Responsibility for the Node 2 development was assigned to the Italian space agency, ASI. The structural design is based on that of the multi-purpose logistics module and the Columbus labora tory. STS-120 Commander Pam Melroy checks out the Harmony module during a crew equip ment interface test. The module is 23.6 feet long and 4.5 feet in diameter. Its pressur ized volume is 2,666 cubic feet. 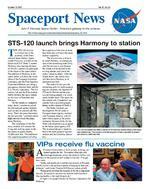 Node 2 on the space station VIPs receive u vaccine A N ounce of prevention is never as easy as being vac encourage employees across the center to follow suit, members of the executive staff waited in line Oct. 15 to get their shots. Safety and health are a number-one priority at Kennedy and this event is the perfect example of keeping to that com mitment, said Center Director Bill Parsons (photo at left). not only for ourselves but also our families and coworkers. Staying healthy is the right thing to do. At right is Associate Director for Business Operations Jim Hattaway. October 19, 2007 Page 2 SPACEPORT NEWS Directors Update Integrated information systems in Constellation's future Staff Writer M ANY Kennedy Space Center employees re cently took an opportu nity to understand how command and control systems, including the kind NASA uses to control space craft, have evolved and will con tinue to impact future programs. The Kennedy Engineering which took place at the Training Auditorium on Sept. 27. Accord ing to Jack Fox of the Engineering Directorate, the mission of the academy is to foster the sharing of technical knowledge across pro grams and generations. If you look at all the work weve done here with command and control systems that are con sures, and you look at the people out here, theyve been dedicated and talented folks and have done incredible jobs, said Ric Hurt, Ap plied Technology director. use of command and control from 1955 to 1966, a period he calls pre digital days. He said the evolution from analog to digital and simplic ity to complexity were predominant images of the consoles from the period. Hurt followed to explain the early days of computers and soft ware, a mystery at the time. He explained that primitive machines were hard to use and had minimal capability at that point, and the usefulness of the computers was unclear. He also described the heritage of KSCs control system, 1970s and 80s continue to meet todays needs through updates. Rick Dawson of the Engineering Directorate contributed by clarify ing how the Launch Processing System continues to thrive. Harris Corporations Lennis Bearden explained many aspects of the discipline, including archi tecture, monitoring, control set and ing resources to minimize technical risk and nonrecurring costs. He also compared past and current software development. Craig Jacobson of the En gineering Directorate and Hurt offered an overview of payload checkout systems. Jacobson in formed the audience about which systems originated at KSC or else where, and explained topics such as the test, control and monitor system. Hurt summarized subjects such as the checkout and launch downside of commercial off-theshelf products, which are available without new development or in the vendors catalog. According to Hurt, workers Terry Greeneld discusses the use of command and control from 1955 to 1966. T HE rules of the road are still the same, but the way Kennedy Space Center is now enforcing those rules is about to change. NASA is enhancing the cur rent point system for drivers who center. The new system, which will include tougher penalties for those who speed or don't wear a seat belt, is expected to take effect beginning By Joe Dowdy Special Operations Manager, Ofce of the Director Nov. 1. center property received points on their driver's license and monetary an administrative citation which could result in the suspension of driving privileges while on KSC property. The centers Protective Servic Space Gateway Support security police in a selective enforcement campaign for KSC roadways. Safety is the number-one NASA core value, and these en forcement efforts are a way to encourage the KSC work force to slow down, obey the posted speed limit and, above all, to maintain a safe environment for drivers, pas sengers and pedestrians. Driving 11 to 19 mph over the speed limit 4 points Following too close 4 points Failure to yield the right of way to emergency vehicles 4 points Failure to wear an approved helmet while driving a motorcycle 3 points Drivers who accumulate 12 points within one year will receive a 30-day suspension of driving privileges on center. A total of 18 points within 18 months will lead to a 90-day suspension, and 24 points within 24 months will bring a one-year suspension. A full list of the new point val ues can be found in KNPR 1600.1, Chapter 19. For more information regard enforcement, contact Special Agent Roger Langevin at 867-3441 or send e-mail to Here are some examples of the new point system: Driving too fast for road condi tions 6 points Failure of the driver or occu pants to use seat belts 4 points Driving 1 to 10 mph over the speed limit 3 points Accumulating 24 points within 24 months will bring a one-year suspension. Terry Greeneld discussed the use of command and control from 1955 to 1966. SPACEPORT NEWS Page 3 October 19, 2007 Emergency Response Team builds skills Staff Writer S CALING up and down the walls of a tower, running up a steep hill and demonstrat all within a few minutes sounds like hard work. For Kennedy Space Centers Emergency Response ticed daily in order to keep the center safe. also known as the ERT, recently demonstrated their abilities during tryouts at the KSC Space Gateway to qualify to participate in the an nual SWAT Roundup International competition. The Roundup will be held Nov. 4-9 in Orlando and is sponsored by the Orange County Sheriffs Department and the Or lando Police Department. The competition draws par ticipation from hundreds of law enforcement and military special tactics/SWAT teams from the U.S. and other countries. Capt. Dan Magetteri, who is commander of the NASA Emergency Response Operations, said participating in the annual Roundup is an opportunity to network and compare tactics and training with other teams. The Roundup competition also serves to validate all of our training as a tactics team, said Magetteri. KSCs eight-person team were re ness, weapons manipulation skills and the ability to make decisions under stressful conditions. Before the international com chance to see the skills of a team from another country. Approxi mately two weeks before the event, the Special City Tactics team from Hanover, Germany, will arrive to train at the ERT facility. Because they cannot bring weapons into the country, the team is allowed to bor row and train with equipment from Kennedy. Last year, the centers ERT more than 100 teams and took second place in the team hostage rescue event. Maget teri said the team is look ing forward to working hard and placing even better this year. Competitors, counterclockwise from above, Eric Munsterman, dragging a dummy; Charlie Pedrick and Michael Pettitt near a wall; Warren Hinson, Pedrick, Jason Sad owski and Dan Magetteri check schedules; Magetteri and Munsterman get ready for rie practice; Speedy Patrick, climbing; and Pettit, running. Page 4 October 19, 2007 SPACEPORT NEWS Driving the M-113 armored personnel carrier is part of the emergency egress training. At right, Pilot George Zamka takes the wheel. The rest of the crew rides along: Mission Specialist Daniel Tani, Commander Pamela Melroy and Mission Specialists Stephanie Wilson, Paolo Nespoli and Doug Wheelock. Below, the crew learns about exiting the shuttle (behind them) in an emer gency. Directly below, tethered for safety in Discoverys payload bay, Tani and Parazynski get a look at the top of the U.S. Node 2, called Harmony, that will be installed on the International Space Station. At the bottom, Parazynski and Tani look at the orbiter docking system. W ITH space shuttle Dis covery on Launch Pad 39A for mission STS120, focus for some KSC employ ees turned to helping the mission crew prepare for the launch tar geted for Oct. 23. From the safety trainers to the Closeout Crew in the White Room, all added their ex pertise to the training and exercises known as the terminal countdown demonstration test. The photos be low capture some of the events the crew completed from Oct. 8 to 10. The test focuses on safety pro cedures such as leaving the launch pad in the event of an emergency, and culminates with a simulated re hearsal of the countdown to launch. The test also provides an opportu nity for the crew to see the payload as it is stored in the shuttles pay load bay. with emergency egress training were Robert Parks and Ken Clark of United Space Alliance, or USA. The breathing apparatus instructor was Ed Ryan of Space Gateway Support. The members of the Closeout Crew who helped the astronauts rations were as follows: (No. 1) Renee Arriens, USA at KSC; (2) Jose Hernandez, Astronaut Support Personnel; (3) George Brittingham, USA at Johnson Space Center; (4) Travis Thompson, USA at KSC; (5) Chris Meinert, USA at KSC; (6) Jack Burritt, NASA Quality; and (7) John Haselhurst, USA at Johnson. The numbers are worn on With help from center employees, STS-120 mission crew trains, practices for launch Oct. 23 on Discovery their suits. The primary payload for mis sion STS-120 is the Italian-built U.S. Node 2. Called Harmony, the module will be installed in a tem node, Unity, until the mission is over since the shuttle will be docked to an existing adapter port where the node is meant to attach. Harmony will be moved by the station crew once the shuttle leaves. Directly below, tethered for safety in Discoverys payload bay, Tani and Parazynski get a look at the top of the U.S. Node 2, called Harmony, that will be installed on the International Space Station. At the bottom, Parazynski and Tani look at the orbiter docking system. With help from center employees, STS-120 mission crew trains, practices for launch Oct. 23 on Discovery Page 5 October 19, 2007 SPACEPORT NEWS (Left) The crew eagerly walks to the Astrovan for the simulated launch countdown at Launch Pad 39A. (Middle Left) Practicing safe proce dures in an emergency, crew mem bers are in slidewire baskets used to leave the launch pad: (clockwise from left) Commander Pamela Mel roy with Pilot George Zamka; Mis sion Specialists Scott Parazynski, Daniel Tani and Paolo Nespoli; and Mission Specialists Doug Wheelock and Stephanie Wilson. (Bottom Left) A crew member exits Discovery through the hatch. (Bottom Right) The crew gathers after the simulated countdown. (Below) the Closeout Crew helps Zamka and Melroy with their launch suits in the White Room. their suits. The primary payload for mis sion STS-120 is the Italian-built U.S. Node 2. Called Harmony, the module will be installed in a tem node, Unity, until the mission is over since the shuttle will be docked to an existing adapter port where the node is meant to attach. Harmony will be moved by the station crew once the shuttle leaves.